The Lunar Oasis, a pressurized mini-greenhouse for use on the surface of the moon, is under development as part of the Google Lunar X prize competition. 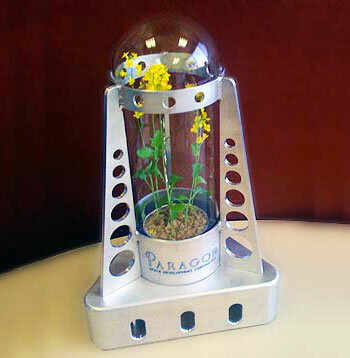 Paragon Space Development Corporation and Odyssey Moon hope to grow a plant from seed and bring it to flower. Since the surface of the Moon is singularly inhospitable to Earth plant life, the lunar greenhouse will need to protect plants from the Sun's rays while providing everything needed for growth. Soil, water, carbon dioxide - and don't forget to take care of that waste product, oxygen. A species from within the Brassica family has been selected as the first growing plant on the Moon. It should need about 14 days of light to grow, flower and then go to seed. As it turns out, this matches the length of the lunar day. A plant from the Brassica family was chosen in part because this family has prior experience in space, having been flown aboard the International Space Station. The entire genome for this plant will be available by flight time, planned for 2012. Update 04-May-2017: Take a look at the inflatable asteroid garden from Asteroid of Fear (1951) by Raymond Z. Gallun. End update. 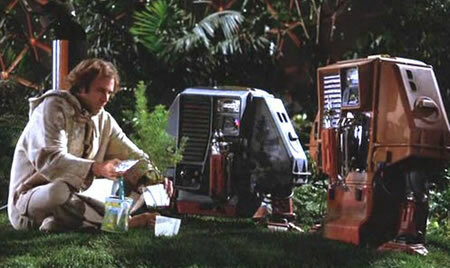 Science fiction fans also may recall the 1972 film Silent Running, which portrayed a future in which all plant life on Earth has been made extinct. Only a few specimens have been preserved in space.